How Does a Disciple Become a Multiplier? Posted on July 18, 2012 February 20, 2019 by Marty Schoenleber, Jr. If the Great Commission of (Matthew 28:16-20) is a command and Jesus tells us to teach those who believe to obey all that he commanded how can we escape the implication that all who are reached are supposed to multiply (reach others / make disciples)? Here’s a simple tool that I learned years ago from the ministry of Church Dynamics. I’m not sure that all the terms I use now are what they originally taught but it works for me and it has been useful as I consult with churches. Elder boards and staffs gain a new clarity that seems to cut through all the activity of ministry and help them to focus on the primary task of making disciples. I call it the PROCESS OF MINISTRY. Here’s how I explain it. 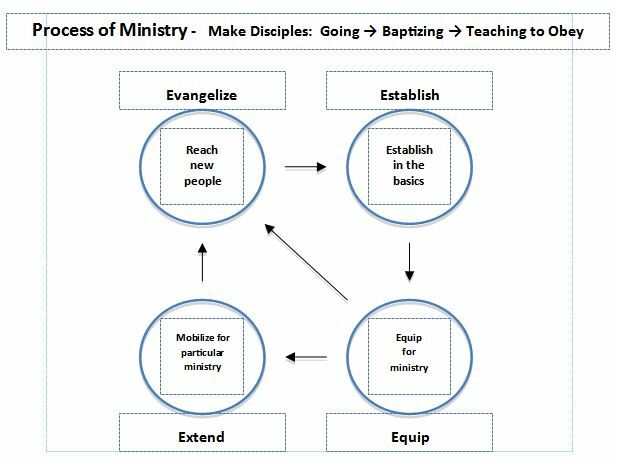 We start in the upper left circle and talk about the primary task of the church is to herald the gospel. If a group of people call themselves collectively a “church” but they aren’t making disciples they are in reality only a social club. The first task of the disciple is to go and make other disciples. Think woman at the well. We move to the circle on the top right. New believers need to be grounded in both new understandings and new habits. They need to be established in the basics. Answer the question, “What do they need to know to grow?” And remember this motto, “The Material You Use is Immaterial.” Click on the blue link for a brief description of why. Remember this as well: every movement to a new circle helps you to accomplish the circle(s) behind it better. Think of the book of 1 Thessalonians and its themes. The task of pastoral leadership is to “equip the saints for the work of the ministry.” In process three, a believer (or a church) begins to equip another believer to multiply him or herself for the gospel ministry. Talk to me about this in the discussion. In the fourth circle, the one on the lower left, we are working to mobilize or extend people into particular ministry within their sphere of influence and friends and in step with their gifts and personality. Almost all problems related to wasted effort or ineffectiveness of ministry in the local church (whether attractional or organic) are caused by a breakdown or absence of process two and three or an utter failure at process one. Figure out how you are going to do that in your church and as a part of your life and you will be faithful to Christ’ command in Matthew 28. Can you talk more about the difference between Establishing and Equipping. I see them as interrelated or even the same. Sorry it has taken me some time to get back with you on this. With the book release, I have been very busy. Anyway, great question and you are right on track. Think of process two (ESTABLISH) as the answer to the question, “What would I tell a new believer in the first 48 hours of his conversion if I knew I might never see him again?” What is the most important thing for him to know so that he can continue to grow?” Now, what would I say if I had 5-6 weeks and could meet once a week? In process three (EQUIPPING) think, what is the answer to the question, “How do I build upon the skeleton of process one and two?” What might be covered in process two is so basic that it still might not even be considered a skeleton. It is just enough to suggest a skeleton. But in process three, we want to begin to entrust more to the disciple. We have higher expectations for them to build into the lives of others. You’re right, we don’t want this to be absent from process two (or even process one) but it becomes more pronounced when we have clearly moved into an equipping for ministry phase. Hope that helps. What do you think? Is that any clearer? It’s much clearer. I think part of the problem for me is that establish is something that often starts during the evangelize step. I know many people have made comments in the past that true discipleship starts with the revelation of who God is. We have to be established in that to 1) come to faith and to 2) obey all that He commands. Until we believe, we’ll never obey and until we hear who He is, we’ll never believe. I like your model. It reminds me a lot of the four fields model for church planting. I think your model and in that model, it’s important that you don’t look at it so much as a linear process, but that all 4 things should be ongoing simultaneously, or at the very least overlapping.